Please add $25.00 for shipping and insurance. Please add $45.00 for shipping and insurance. "In my new Mansions in Paradise series series, I try to create mansions truly worthy of a paradise, whether earthly or heavenly. At once majestic, comfortable yet human in scale, Lakeside Manor, first in my new series, nestles along the shore of a cobalt blue lake. The gardens are lavish with flowers; radiant sunsets last for hours. This grand mansion is complete with cozy nooks where you might comfortably settle in for a warming cup of tea. A weathered old stone bridge invites visitors to stroll the verdant grounds, while the brook at the left provides a tranquil background murmur sure to make the spirit soar." 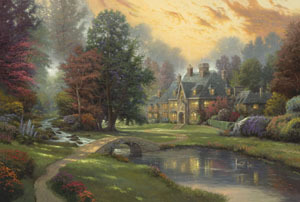 Lakeside Manor copyright© 2006 by Thomas Kinkade is prohibited from being copied. Thomas Kinkade art, lakeside manor, kinkade manor houses, artwork, art work, canvases, images, paintings, pictures, and prints of Lakeside Manor by artist Thomas Kincaid for sale. Lakeside Manor painting by artist Thomas Kinkade can be purchased in art print or canvas form at special sale prices at Christ-Centered Art.